GENERAL FREDERICK M. FRANKS JR.
Fred Franks’ life story is an amazing parallel to the story of the US Army- from Vietnam to Desert Storm. He served in Vietnam, was seriously wounded, overcame a very challenging time and recovered over many years, re-bounded and eventually led US forces to crush the third largest army in the world in 1991. In 1991 the world held its collective breath as it prepared for the impending war that everyone knew was coming. Allied forces, overwhelmingly American, stood on the border of Saudi Arabia prepared to invade and liberate Kuwait from the Iraqis who had invaded it six months earlier. Allied air forces pounded Iraqi forces twenty-four hours a day throughout Kuwait and Iraq for five weeks starting January 17th, 1991. Many aircrews were shot down and several were killed or taken prisoner of war as allied air forces prepared the battlefield for the upcoming invasion. The American public was told to expect up to 20,000 casualties to liberate Kuwait from Saddam Hussein’s Iraqi army- which was at the time the third largest army in the world. At the order of President George H.W Bush the ground invasion began on February 24, 1991 as allied armored forces launched the largest invasion since Normandy. In what became known as the “left hook”, US forces spearheaded the invasion of Iraq and enveloped the Iraqi forces still in Kuwait. In 89 hours the VII Corps of US and British forces, led by Lieutenant General Fred Franks, accomplished the impossible- attacking over 250 kilometers with four US divisions and one British division armored corps across the desert- linking up with the XVIII Airborne- crushing the Iraqi forces and liberating Kuwait. The entire ground war lasted less than four days with 187 Americans servicemen killed in action. The leader of this enormous VII Corps that enveloped the Iraqi Army, Fred Franks, had overcome incredible odds to be in this leadership position and had battled adversity to achieve this command. Twenty years earlier his life and his army career had nearly come to an end when he had been grievously wounded leading soldiers in Cambodia. Fred Franks was born in West Lawn, Pennsylvania, and attended local schools there, graduating from Wilson High School in West Lawn in 1954. He then attended West Point and graduated 3 June 1959 commissioned as an Armor Officer. He and his sweetheart Denise married 6 June 1959 and have been married over fifty years. He graduated from Airborne and Ranger Schools and was assigned to multiple assignments in both the 3rd and 11th Armored Cavalry Units. He and Denise had a daughter Marjorie in 1961 and then he deployed to Vietnam in 1969. 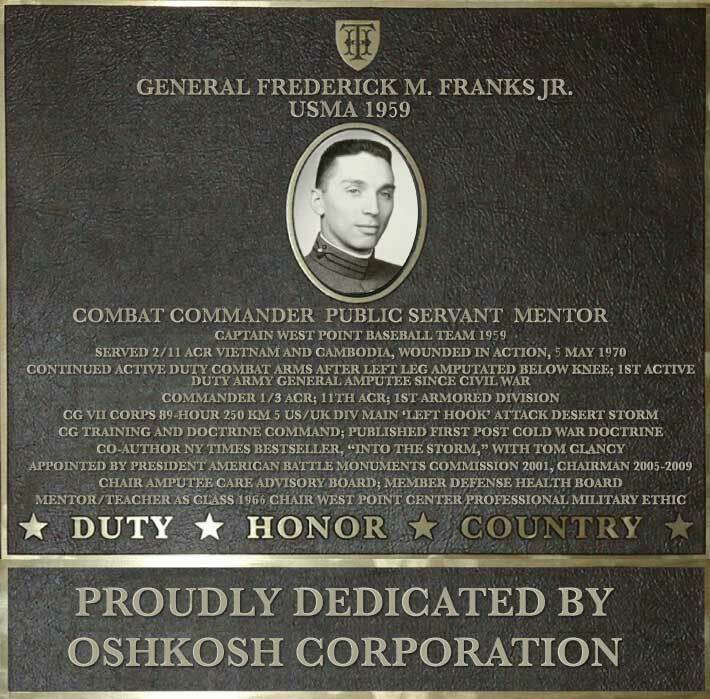 As a Major, Fred Franks served in combat in Vietnam as Operations Officer (S-3) 2nd Squadron, 11th Armored Cavalry Regiment starting in August 1969. During the invasion of Cambodia a North Vietnamese grenade seriously wounded him on May 5, 1970 near Snuol, Cambodia. After being medically evacuated and enduring multiple surgeries, his left leg was amputated below the knee at Valley Forge General Hospital in January 1971. From May 1970 to February 1972 he recovered at Valley Forge General Hospital and eventually returned to active duty in February 1972 with a prosthetic leg. The US Army was badly battered after Vietnam, and the 1970s were very difficult. This time in his life and his families was very challenging- a time that they forever would refer to as the “Valley Forge Experience” after the experience the Continental Army had itself endured in the winter of 1778-1779 at Valley Forge. The Valley Forge experience of Fred Franks and his family, just as the experience of the American Army in 1778, was a challenging time but one from which it would grow stronger. Likewise, this time in the early 70s was one of the most difficult for the US Army in modern times. But it, and Fred Franks, would recover, re-build and re-arm. The 1980s saw the expansion of the Army under President Reagan and the Army was modernized to fight the next war. During the next eighteen years Fred Franks commanded Armored Cavalry units at the squadron in the 3d Armored Cavalry Regiment and the Regimental level of the 11th Armored Cavalry Regiments in periods from early 1975 to 1984. He received two Master Degrees from Columbia University and graduated from the National War College. Twenty years after being wounded in Cambodia in 1990, LTG Fred Franks was commanding the VII Corps in Germany when Saddam Hussein’s forces invaded Kuwait August 2, 1990. For the next several months, Third Army (VII Corps and XVIII Corps) deployed to defend Saudi Arabia and then prepare for the liberation of Kuwait. In what would be known as “Operations Desert Shield and Desert Storm”, Lieutenant General Franks commanded the 146,000 US and British forces of VII Corps that attacked over 250 kilometers in 89 hours and as part of the Coalition liberated Kuwait in February 1991. He concluded his active service as Commanding General Training and Doctrine Command (TRADOC) from 1991-1994, responsible for the U. S. Army’s school system and for formulating concepts and requirements for future land warfare, publishing the first post Cold War Army warfighting doctrine. After retiring General Franks actively supported military and veterans causes. President George W. Bush appointed him to serve on the American Battle Monuments Commission (ABMC) and he served as the ninth Chairman of ABMC from January 2005 through January 2009. General Franks was appointed to serve on the Defense Health Board, and chaired the US Army Amputee Advisory Board. He serves as a senior advisor and with Veterans Outreach for the Red Sox Foundation-Massachusetts General, Home Base Program, committed to serving the needs of Veterans and their Families for PTS and TBI. He holds the Class of 1966 Chair in the Simon Center for the Professional Military Ethic at the United States Military Academy at West Point, teaching Battle Command, and serving as a mentor to the US Army’s current Profession of Arms after ten years of war study. He is co-author with Tom Clancy of a NY Times Bestseller, Into the Storm: A Study in Command. He received four awards for valor, two Purple Hearts, numerous military awards for service, and individual decorations and awards from France, Germany, Spain, and his native Pennsylvania. In May 2000 the Association of Graduates named him a Distinguished Graduate of West Point. In May 2008 he was inducted into the Ft. Leavenworth Hall of Fame.